Fans looking to chase their kids around with an axe now have the perfect place to do that. 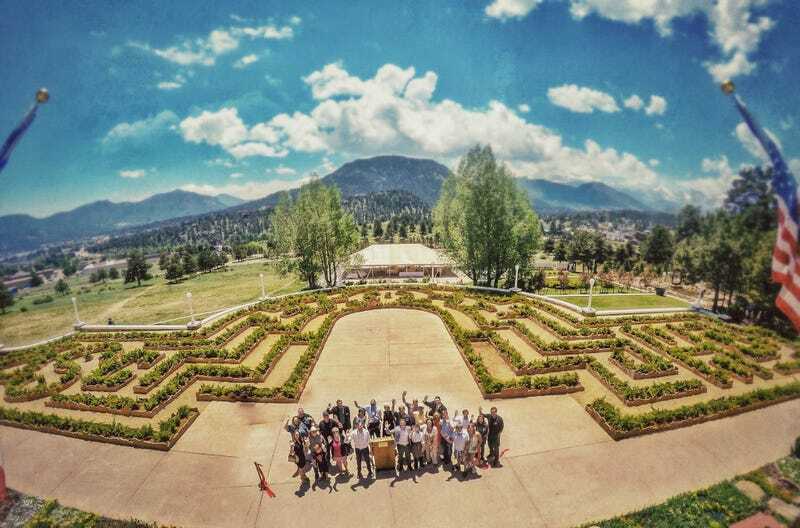 The Stanley Hotel, the inspiration for the Stephen King novel and Stanley Kubrick film, The Shining, has finally opened its very own hedge maze. An international contest was held to select the maze design and out of 329 entries from 31 countries, a panel selected the maze of New Yorker Mairim Dallaryan Standing earlier this year. It officially opened last week. Unlike the maze in the film, the maze at the hotel is considerably smaller (mostly because of the available flat space on the grounds of the hotel) and much lower to the ground (for now, it’ll grow). Basically, it’s a fun addition to the experience, but still very far away from the frightening space Kubrick created for his film, which was on a sound stage and expanded with matte paintings. By the way, the Stanley Hotel is not named after Stanley Kubrick. It’s named after F.O. Stanley, the man who originally bought the land and built the first parts of the hotel. The coincidental connection is just one of many eerie things about the space, which has daily ghost tours and an annual horror-themed Stanley Film Festival.